﻿ menu planning by guest mom deb. menu planning by guest mom deb. Hello Petit Elefant readers! I must say that I had a very great and delightful time here this week. I appreciate all your comments and loved hearing from you. I want to leave you with this final post on creating a menu. Please continue to keep in touch… you can find me on my blog here. I hope you all have a wonderful holiday season. There is really no right or wrong way to create a menu plan. It’s really just finding what works for you and going with it. This is the method that I use. I first start with the items I have. I usually some meat in the freezer or leftovers that need to be eaten. As you can see on the menu, I had hamburger and chicken in the freezer and combined those with sides or items I already had to make a meal. In this instance it was chili and stir-fry. After I’m done with the items I have, I fill up my meals. 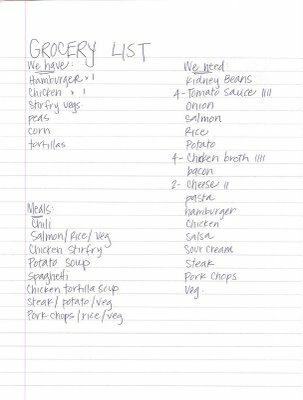 I grocery shop once every two weeks so I try to have 8-10 meals on my list. We usually go out to eat once a week and have left overs a couple times. Then I look in my cupboards to see what I’m missing for these meals. Those items go on my list. 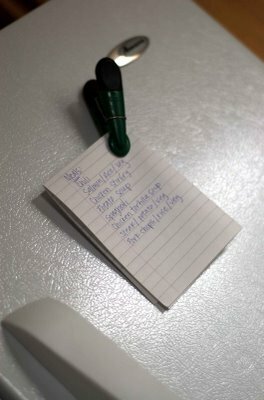 I also have a running list of staple items that I get EVERY TIME at the store (i.e. milk, cereal, apples, yogurt, bread, etc.) I don’t worry about putting these items on my list. My list is just for items unique to this two week time frame. After I get back from the store, I fold my list into fourths and hang my menu on the fridge. Then I can pick what I want to eat & pull the meat from the freezer a day or two in advance. This methods seems to work for us, but there are other options as well. LobotoME has a great menu planner, (she also has some other great organizers as well). 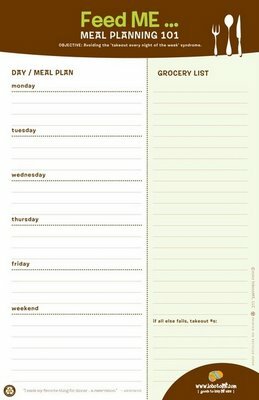 If you want to plan which day you are having your meals, this is a great tool to use. On the side it also has a grocery list. I have a great friend that stocked her freezer with meals when she had her last baby. I thought this would be a great idea for working moms. There are plenty of books out there to help plan your meals, (here is one example where you can make 30 meals in one day). This is something I would like to try, but just haven’t had the chance yet. Does anyone else have any tips or tricks that work for them? I would love to hear them. Thanks again for listening and I hope to see you around! << working and juggling family life by guest mom deb. This is perfect! I love seeing how other women do it, I always get good ideas. This is awesome for me as well. Thank you for this. I will see about putting it to use this weekend. Ah, thanks ladies!! I am welcome to any other ideas as well. Has anyone ever tried the freezer meals? We have a food saver- it works great for freezing meals. If we make a pulled pork (which requires a whole pork shoulder- which in turn makes way to much for us) we just foodsave half. Pull it out and defrost whenever needed. I also have a potpie recipe that makes two 9in pies- and is way to difficult to halve- so we foodsave the other one for another meal sometime. Chilis and soups are good to freeze too- those recipes usually make alot…so if you don’t feel like eating chili for three days- just freeze half for someother time. Place foodsaver soup in a pot of water on the stove and warm it up to defrost the soup. Once the soup is warm- pour it in an empty pot, heat and serve- super easy! Guess what I’m saying is- get a food saver…its the best! I’m glad Audra mentioned the foodsaver. I’ve been looking into getting one and have resisted. Mainly because I’m lazy. Now maybe I’ll get one b/c it will actually help me be lazy! I freeze everything. We stock up on things like fresh produce from the Farmer’s Market and just pull them out as needed in the off season. I make chicken stock, beans, and other “base soups” in large quantities and freeze them in 2 cup increments in quart freezer bags. You can also freeze leftover soups and fresh herbs. I even freeze bread (my recipe makes 3 large loaves). I love my freezer.